our mini party was a success! hope to have you on our next guest list! And here's our flickr gallery! (Sorry for the delay, it's been a rough week). If I did not get a photo from you and you'd like to be added, or you'd like to replace a photo with one on the recipient please drop us a line! Everyone's packages (should) have arrived and it's time to celebrate! We had a bit of a party collision this weekend, as we didn't realize we were ending the swap over Easter weekend when we set it up! But all's well that ends well, right? And now it's time for the BIG REVEAL! Here's the list of who drew who; with links to everyone's posts. Thanks again to all our lovely guests for making our party so much fun! This go-round the meme is not actually required, since you are just about all already at work on your aprons! But, still, we're tagging ALL of you to do this for fun and to get to know a little more about each other. Please answer as soon as you're able and we'll post links to everyone's answers when we're all done! Here's the scoop on the recipe cards. You need to pick out three recipes that fit the theme. Then make three 3"x5" recipe cards (if you really need more room, you can make a 2-part card in there if you need to) to fit the theme and maybe even coordinate with your apron! Craftiness is encouraged, with a few limits: no significant 3-D elements, and nothing projecting outside of the card's edges. Also remember; while the recipes all need to be kid-tested favorites, the recipe cards are for your swap partner, not their mini! You can check previous swap posts for lots more ideas! 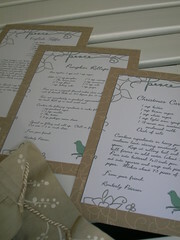 If you are not all that crafty on paper, it is totally fine to go find yourself some cute pre-made cards and use those. There are tons of cute 3x5 cards out there, I looked on etsy and found these adorable parisian motif cards, cute owl cards (no size listed though, so check before buying! ), and my favorites, the Domestic Divas cards! If you want to print something out, I found a cool recipe card maker online that will format 3x5 cards for you (with art!) 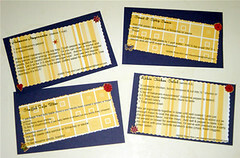 for free; or you can download free recipe card templates for MS Word.